The Mark Trammell Quartet helps kick off the year 2014 in gospel music with their brand-new release, Your Walk Talks. Anticipation has been high for this recording for several reasons. It is the debut recording for the quartet featuring fresh face Dustin Black at tenor. It is also the group’s first recording of mainly new songs since Testimony, released in 2010. Finally, it was announced on Christmas Eve that it would be the inaugural recording on the quartet’s new label, Crimson Road Productions. Your Walk Talks, a highly enjoyable collection of quartet music, proves worthy of lofty expectations, and more. While Your Walk Talks is a balanced recording in terms of tempo, its hallmark for me is a pair of outstanding fast songs, both penned by prolific hit-maker Dianne Wilkinson. I believe the Mark Trammell Quartet has been in need of some great, new quartet songs, and these two are easily the best they’ve had since becoming a quartet. “When the King Comes to Claim His Throne” has it all: a masterful Biblical lyric on the Millennial reign of Christ, an infectious melody, and an exciting arrangement that keeps the listener on his toes. All of those qualities (except the lyrical topic, of course) also describe “I’ll Take it to the Grave,” which Wilkinson wrote with Rebecca Peck. There is a delightful bit of counterpoint at the end that “puts the cherry on top”. Both of these songs feature a false ending and turn-around, and both are well-deserved and welcomed. Another fine new uptempo song is the opening track, “Don’t Stop Running,” penned by lead singer Nick Trammell. One can easily hear the quartet opening a concert with this energetic number. The younger Trammell further shows off his songwriting chops with “To Know He Knows Me,” co-written with the great Rodney Griffin. It features a wonderful message, though a little tongue-twisting, set to a soothing mid-tempo track with a jazzy lean. Both are also vocal features for Nick, who sounds his best yet on this recording. The quartet goes again to the deep well of Griffin’s pen with the title track, already an apparent favorite among listeners. “Your Walk Talks” is also on the jazzy side, though much quicker and bouncier, and contains an excellent practical lyric with a fun rhyme scheme. As you can already tell, the overall pace of Your Walk Talks is markedly different from the quartet’s previous recording, Lifetime. While the latter had several soaring ballad arrangements from Lari Goss, this recording only contains one track that approaches that style. “Man of Sorrows,” another Wilkinson/Peck collaboration, really sings more like a hymn than a traditional power ballad, giving it a classic sound befitting its timeless message on the crucified Christ. It incorporates portions of “Hallelujah, What a Savior” and “Oh, What a Savior” to bring the track to a moving finish. It takes until the last track on Your Walk Talks to finally get a good earful of Dustin Black, and it is worth the wait. “I Wouldn’t Have It Any Other Way” is a wonderful song with an easy-listening style (again from Wilkinson & Peck), perfectly suited to show off one of the smoothest tenor voices in gospel music. He might be considered the opposite in style to super-high traditional tenor Eric Phillips, but Black gives the Mark Trammell Quartet their most pleasant blend yet. Your Walk Talks does contain three songs that are not brand new. The most recognizable is the Gaither classic “Thanks to Calvary,” which is an obviously perfect feature for the “Younce-ian” Pat Barker. It is a classy and traditional arrangement, and is all the more poignant as a song of personal testimony for Barker. On the other end of the spectrum is a rather obscure convention number, “I’ll Go Over Jordan Someday.” There’s nothing awe-inspiring about this track, except for the fact that this type of song hardly ever gets recorded anymore. I am glad to hear the classic convention genre living on through the recording of songs like this. Finally, “God’s Been Faithful,” a slow-paced track penned by Wilkinson and Scott Inman, is almost new, having been recorded by Liberty Quartet last year. It is one of my favorites on the album for a couple of reasons: its stirring message of God’s faithfulness, and the most powerful vocal feature for Mark Trammell on the disc. 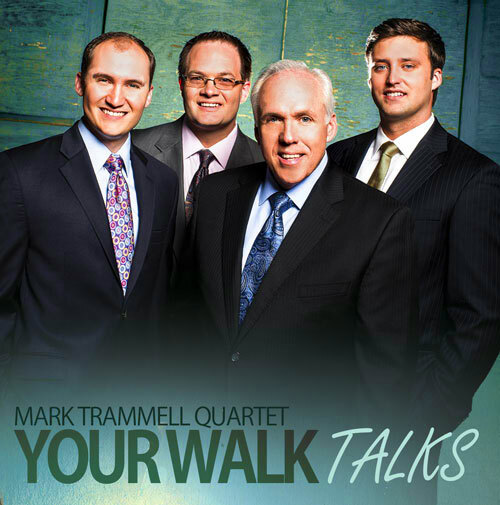 Your Walk Talks is the best collection of new songs the Mark Trammell Quartet has recorded. It’s a difficult comparison to Lifetime, amazing in its own right, in that they are two totally different recordings. But this to me is certain: the Mark Trammell Quartet has never sounded better, and they now have a repertoire of songs to keep them in the elite class of southern gospel quartets. Mark Trammell Quartet is the best!!! The Mark Trammel Quartet gave an outstanding performance and testimony at the Blue Gate Theater introducing the songs on this new album. I couldn’t go home without it and I’m so glad I didn’t. This review hits it right on. It’s wonderful. They are wonderful. My new favorite quartet – every voice is outstanding and their blend superb. Pat’s bass voice is the best in the business and he does a beautiful job on the songs that features him. Who did the orchestrations on this project? trying to find the lyrics to a song that I heard sang when I was a child called Running From God. I believe the Bibletones sang it in Lufkin Texas in about 1994 maybe earlier on not sure. Any help would be appreciated.